The Doha Corniche is a waterfront promenade extending for seven kilometers along Doha Bay in the capital city of Doha, the state of Qatar. Annual celebrations of national holidays such as National Sports Day and Qatar National Day are centered on the Doha Corniche. 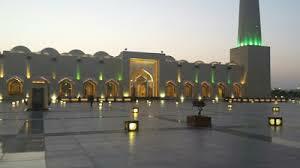 It is a popular tourist and leisure attraction within Qatar. The Corniche used to be an empty stretch of walkway in which the only visible edifice was a Sheraton Hotel, but development has increased in the 21st century with dozens of skyscrapers being built towards the north of the Corniche. The area's development is part of the economic boom the country has been experiencing and part of an effort to promote tourism, which was facilitated by the 2006 Asian Games. Many of Doha's most iconic landmarks are found along the Corniche, beginning from around the Museum of Islamic Art and ending at the Sheraton Park near the distinctive pyramid-shaped Sheraton Hotel.